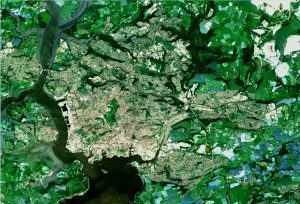 Sentinel-2 Image of Plymouth from 2016. Data courtesy of Copernicus/ESA. Sentinel-2B was launched at 01:49 GMT on the 7th March from Europe’s Spaceport in French Guiana. It’s the second of a constellation of optical satellites which are part of the European Commission’s Copernicus Programme. With a swath width of 290 km the constellation will acquire data in a band of latitude extending from 56° South around Isla Hornos, Cape Horn, South America to 83° North above Greenland, together with observations over specific calibration sites, such as Dome-C in Antarctica. Its focus will be on continental land surfaces, all European islands, islands bigger than 100 square kilometres, land locked seas and coastal waters. The satellites will orbit 180 degrees apart at an altitude of 786 km, which means that together they will revisit the same point on Earth every five days at the equator, and it may be faster for parts of southern Europe. In comparison, Landsat takes sixteen days to revisit the same point. 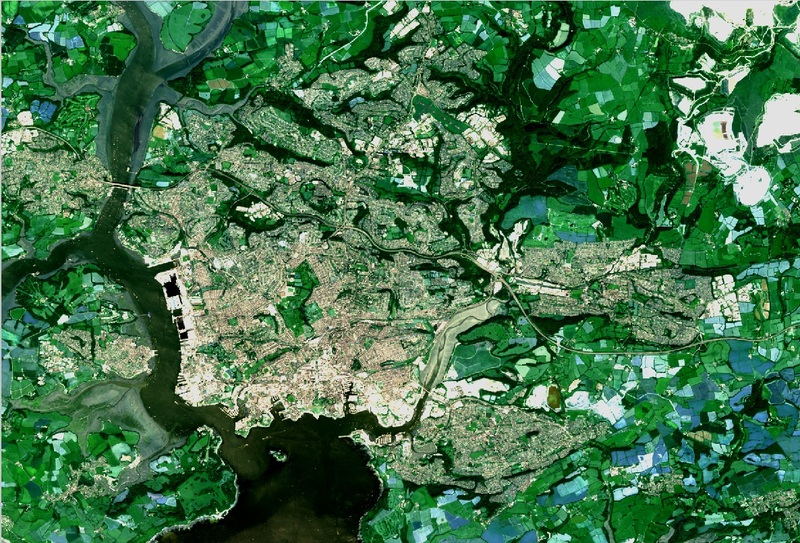 With all Copernicus data being made freely available to anyone, the short revisit time offers opportunities small and micro Earth Observation businesses to establish monitoring products and services without the need for significant investment in satellite data paving the way for innovative new solutions to the way in which certain aspects of the environment are managed. Clearly, five day revisits are not ‘real-time’ and the spatial resolution of Sentinel data won’t be suitable for every problem.There is joint work between the US and Europe, to have complementarity with Landsat-8, which has thermal bands, and allows a further opportunity for cloud-free data acquisitions. Also, commercial operators provide higher spatial resolution data. At Pixalytics we’re supporters of open source in both software and imagery. Our first point of call with any client is to ask whether the solution can be delivered through free to access imagery, as this can make a significant cost saving and allow large archives to be accessed. Of course, for a variety of reasons, it becomes necessary to purchase imagery to ensure the client gets the best solution for their needs. Of course, applications often include a combination of free to access and paid for data. Next’s week launch offers new opportunities for downstream developers and we’ll be interested to see how we can exploit this new resource to develop our products and services. This entry was posted in Copernicus, Data, Earth Observation, ESA, Micro Business, Remote Sensing, Sentinel, Space Can Help, Space Industry, UK Space Industry and tagged constellation, Copernicus, downstream, Europe, European Commission, European Space Agency, freely available imagery, MSI, Multispectral Imager, open source, satellite, Satellite data, satellite imagery, Sentinel, Sentinel-2 revisit time, Sentinel-2B, spectral bands, swath by Andy. Bookmark the permalink.